The rise of virtualization has ushered in dramatic shifts in the computing landscape: Servers are more efficient and users can be more agile. But it's also created new challenges for backup and recovery. Instead of having a single server that can be backed up to a tape library weekly, for example, now a handful or more of virtual machines are spread across a server and they can be spun up and down within minutes. Backing up to tape doesn’t work in that environment. Veeam backs up VM images instead of using an agent to back up files. In the event of a disaster, virtual machine images that are stored in a central location can be rebooted almost instantly. Veeam’s software runs through the hypervisor - currently VMware and Microsoft Hyper-V are supported - and takes snapshots of virtual machine images. After an initial full backup, the software then uses caching and deduplication processes to only store new information in the VM images. 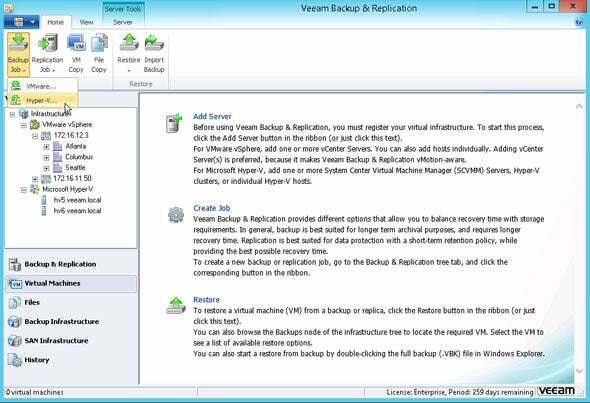 Veeam’s software works across VMware and Microsoft Hyper-V platforms. Since being founded in 2006 the company has seen impressive growth. It boasts more than 20,000 resellers, which account for most Veeam sales. It has about 80,000 customers and this year has hit a quarter of a billion dollars in revenue. This week the company announced that its Veeam Cloud Provider program, which is the license for cloud service providers to offer the Veeam software, has surpassed 7,000 members. The company cites notable traction in the European market, including at OVH, one of the region’s largest web hosting companies. Employing this image-based approach allows Veeam and its partners to offer customers unique platforms for using the backed up images. Some customers use the backed up or replicated VM images as a test and development lab, allowing changes to software to be practiced without impacting the production environment. Other cloud providers are able to offer less than five-minute guaranteed backups in their service-level agreements with full VM backups using Veeam’s software. Veeam is headquartered in Switzerland, but has major offices in Ohio. Unlike many startups, the company has never received any venture funding; its founder and CEO started the Windows migration management company Aelita Software, which was sold to Quest Software for $115 million in 2004 (Quest was later bought by Dell). Founders used part of the proceeds to start Veeam. The backup and recovery market is a crowded one, with big companies like IBM, Symantec and EMC all having strong offerings, Gartner notes in its report. Symantec is seen as a market leader with its NetBackup and Backup Exec being the top revenue-generating products in this category, according to Gartner. The company’s V-Ray technology is focused specifically within Veeam’s niche of virtualized workload backup and recovery, too.